Surgical Gloves are worn by medical practitioners during medical treatment to avoid the transfer of germs, infectious diseases between the doctors and patients. They are mainly used in hospitals and laboratories. Made from the natural rubber, they are most flexible and resilient so as to fit the any size of the hands. They are available in different sizes. Gloves stand fit to hand so that the caregivers feel comfortable in holding the objects and performing medical practices. Surgical gloves are made of different polymers including latex rubber, nitrile rubber, vinyl and neoprene. But latex surgical gloves are very popular. Latex gloves are manufactured from pure natural rubber sub-product called latex. They are extracted from the rubber trees in the liquid form. They are exuded from the rubber tree after a cut or injury on the tree. They are in pure white milky color. This liquid is then processed with different chemicals. From this processed latex liquid, gloves are manufactured using special machines and processes. 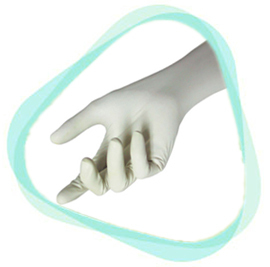 Surgical Gloves are available in powdered and powder free types. Surgical gloves are often added with cornstarch powder to reduce friction. They are called powdered surgical gloves. Powder acts as a lubricant and facilitates easy wearing of gloves. It also absorbs any sweating done, inside the gloves. When the hand of the surgeon is wet, it becomes difficult to wear gloves. In such cases powdered surgical gloves will be of great relief. In some cases powdered gloves have been found causing allergies to the medical caregiver. In such scenarios latex powder free surgical gloves are used. Latex hand gloves are used in medical surgeries, medical treatments, testing, diagnostic and biological laboratories. The basic requisites of surgical gloves are it should not cause any skin allergic reactions, should not impart color & odor to medical/biological fluids and more importantly it must not tear when in use. Moreover these gloves should cling to human hands to provide required grip in holding the objects. Proper elasticity is required for hand gloves. Both Powder Free and Powdered surgical gloves offered by us are rigorously tested for these properties so as to deliver zero defect gloves to end users. Liberty is housing most modern and sophisticated glove testing equipments. What Should You Look At While Buying Surgical Gloves? It is an important question for all organizations who intend to purchase surgical hand gloves. It is natural that there are many latex rubber companies across the world that is into manufacturing of these latex surgical gloves. Few things you need to emphasize while selecting a supplier are their experience in the field, quality standards (in terms of skin allergy, side effects on wearing etc), infrastructure to handle bulk orders, ability to deliver the goods to your geographical area and last but not least, the costing of the products. The gloves must also be complaint with quality bodies like FDA, ISO, CE,GMP etc. There are a number of materials that are used to manufacture surgical gloves. These include latex, Nitrile, neoprene, Poly isoprene and vinyl rubbers. While latex gloves continue to be one of the most widely used materials for surgical gloves, they surely do provide with certain user challenges. Latex gloves are available in the market in two varieties: powdered gloves and powder-free gloves. The powdered gloves are quite comfortable to wear as they are sturdy and flexible and use cornstarch for the purpose of lubrication. However, they can also cause severe skin allergies and reactions when worn for longer periods of time. As cornstarch is used in these gloves for lubrication which aids in easy wearing, one should make sure that the hands are kept moisture free. On the other hand, the powder free variants should always be handled with care as they are not that sturdy and might tear easily while handling surgical instruments. If one intends on using powder free surgical gloves, he or she must go for ones that are of the highest quality in order to prevent any possible damages. Complies with the requirement of ASTM D 3577, EN 455-1, 2, 3, 4 standards. Protein <50ug per glove (below detection limit). Dermal sensitivity: None as per ISO 10993 Part 10 tests. AQL 0.65 for holes to ensure barrier properties.